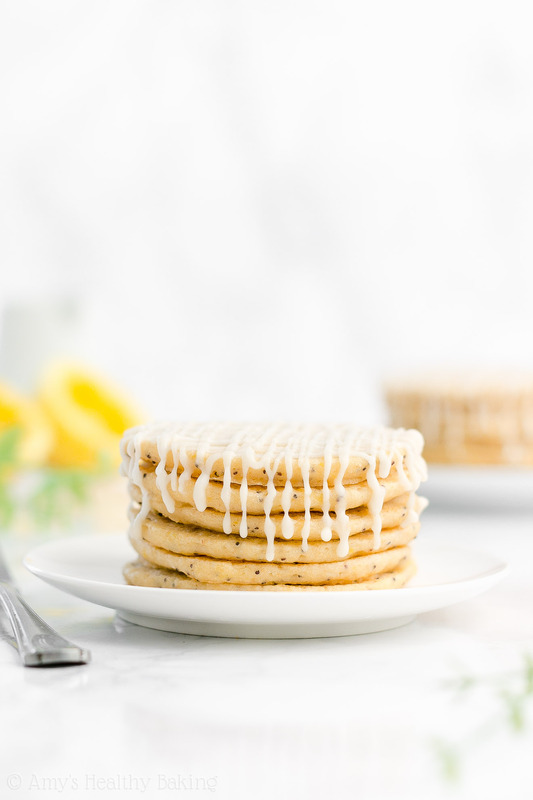 Learn how to make these fluffy lemon poppy seed pancakes from scratch! 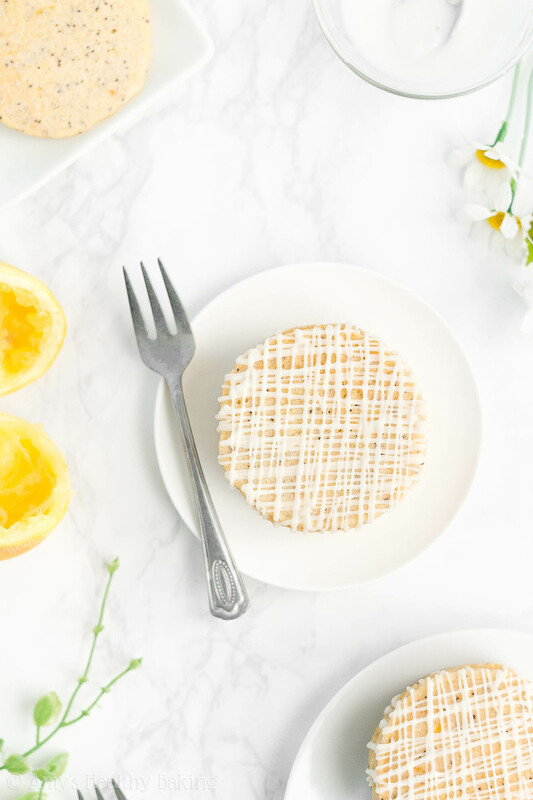 They’re full of bright citrus flavor and perfect for weekend brunches—or even meal prepping for quick and easy weekday breakfasts! Made with no refined flour or sugar and just 129 calories in each stack! As a teenager, I participated in my church youth group’s summer service project, where we helped build and repair houses for people who couldn’t afford it themselves. My first year, our leaders picked a location around the southern border of Washington, so we split the 15-hour drive from where we lived in the San Francisco Bay Area into two days. On our way up, we stopped in Oregon for the first night, and we stayed in a church in Bend that graciously opened its doors for us to keep our travel and hotel costs as low as possible. Everyone had packed sleeping bags, so we unrolled them in the church’s dining hall to get as much rest as we could. After our full week of construction, we packed up our three vans to head back home, but we stopped in Northern California for that night, a few hours south of Bend, to minimize the driving on our last day of the trip. We spent the night on a different church’s floor, and our leaders surprised us the next morning by taking us to IHOP for breakfast to celebrate all of the work we had done and lives we had changed. As my first time in the restaurant, my eyes nearly popped out of my head when I saw the menu. Up until that point, I thought there were only two flavors of pancakes, plain and blueberry, because that’s all Mom ever cooked for us at home. Yet the restaurant’s menu boasted nearly a dozen different options. In addition to the two I knew, they offered chocolate chip, strawberry banana, cheesecake, birthday cake, pure chocolate, nut and grain… And five different syrup flavors too, not just the regular maple syrup we bought at home! 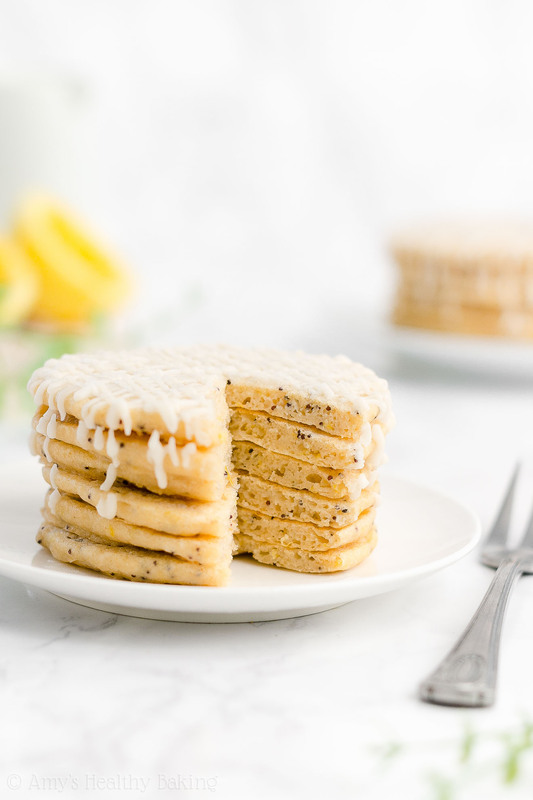 And now, I can also add these Lemon Poppy Seed Pancakes to my list! They’re light and fluffy with lots of bright sunshiny flavor and a smattering of those cute little poppy seeds in every bite. Yet unlike the restaurant’s pancakes, these contain no refined flour or sugar and just 129 in each stack! That’s definitely my idea of a delicious—yet still wholesome—pancake breakfast! 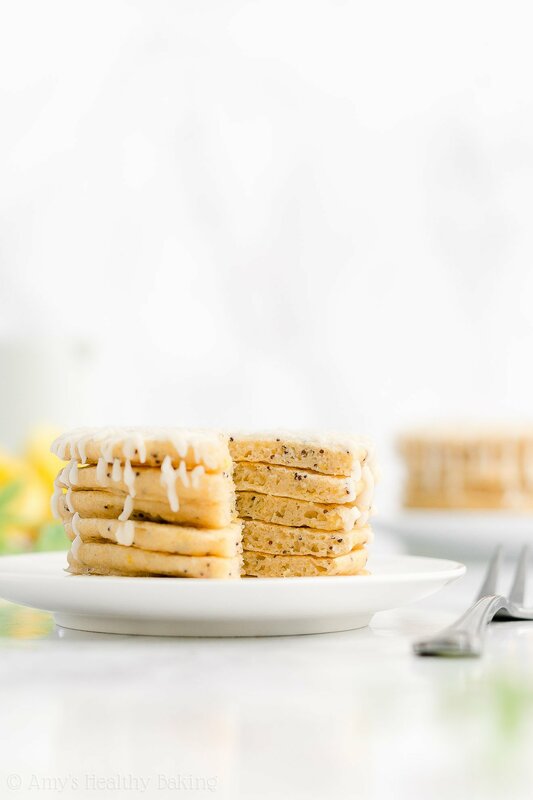 So let’s go over how to make these healthy lemon poppy seed pancakes! You’ll start with white whole wheat flour, poppy seeds, and a generous amount of lemon zest. The zest actually provides the majority of the citrus flavor (not the lemon juice! ), so don’t skip it! I think those little golden flecks look so cute in these pancakes too. Tip: Pick lemons that have pure yellow skin without any green spots for the best flavor! If you’ve browsed through my recipes before, then you’ve probably heard me say this… But it’s worth repeating. White whole wheat flour actually exists, and it’s not a combination of white (aka all-purpose) flour and regular whole wheat flour! Instead, white whole wheat flour is made by finely grinding a special type of soft white wheat (hence the name! ), whereas regular whole wheat flour comes from a heartier variety of red wheat. They both have the same health benefits (like extra fiber! ), but white whole wheat flour has a lighter taste and texture (much less wheat-y and closer to the flavor of all-purpose flour!). This makes white whole wheat flour perfect for these pancakes because it lets the fluffy texture and bright lemon flavor really shine! Unlike traditional pancake recipes that call for a few tablespoons (if not more!) of oil or melted butter, you just need 1 teaspoon to make these. 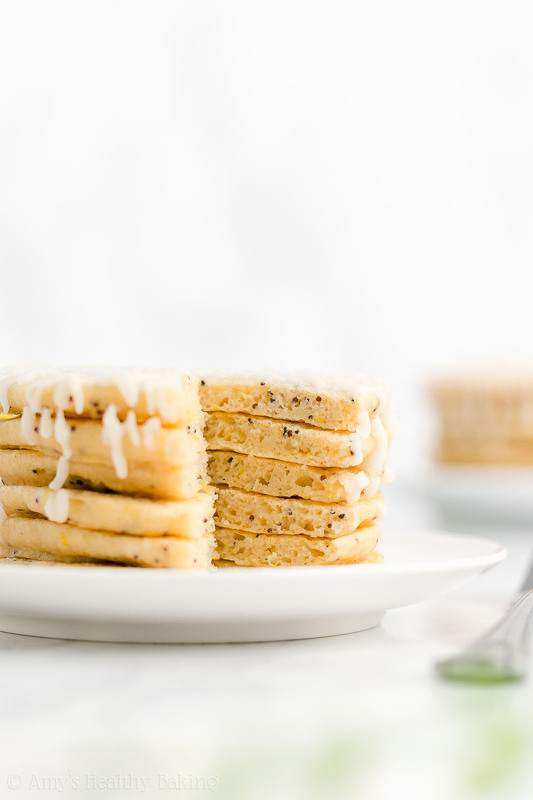 That really helps keep these healthy lemon poppy seed pancakes low calorie and low fat! Then the rest of their tender texture comes from one of my favorite ingredients in healthy baking… Greek yogurt! 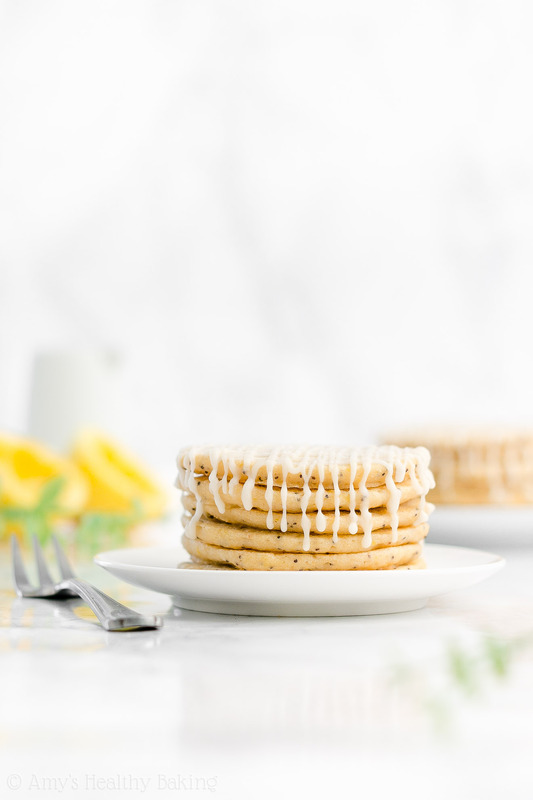 Greek yogurt adds the same moisture to your pancake batter as extra butter or oil, and it also gives your healthy lemon poppy seed pancakes a protein boost. I call that a win-win! To sweeten your pancakes, you’ll add in just a hint of pure maple syrup. You want the kind that comes directly from maple trees, not “pancake” syrup! The only ingredient on the bottle should be “pure maple syrup,” and it’s generally sold in thin glass bottles or squat plastic jugs (like this!). Tip: I only used a teensy tiny amount of maple syrup because I know how much my family drizzles on their pancake stacks… So adding more to the batter seemed like overkill. 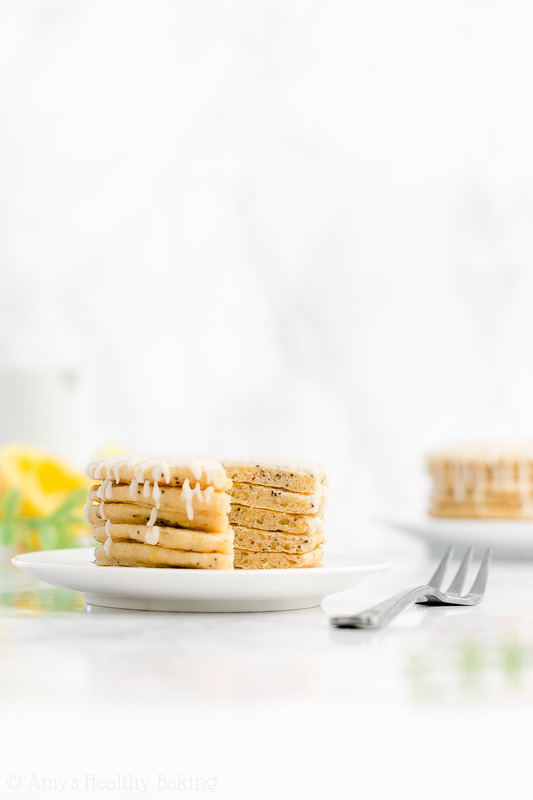 If you’d like sweeter healthy lemon poppy seed pancakes, then see the Notes section of the recipe! The lemon juice (an acid) reacts with the baking soda (a base), which creates lots of air bubbles. As a result, this pancake batter is the bubbliest and fluffiest I’ve ever seen! 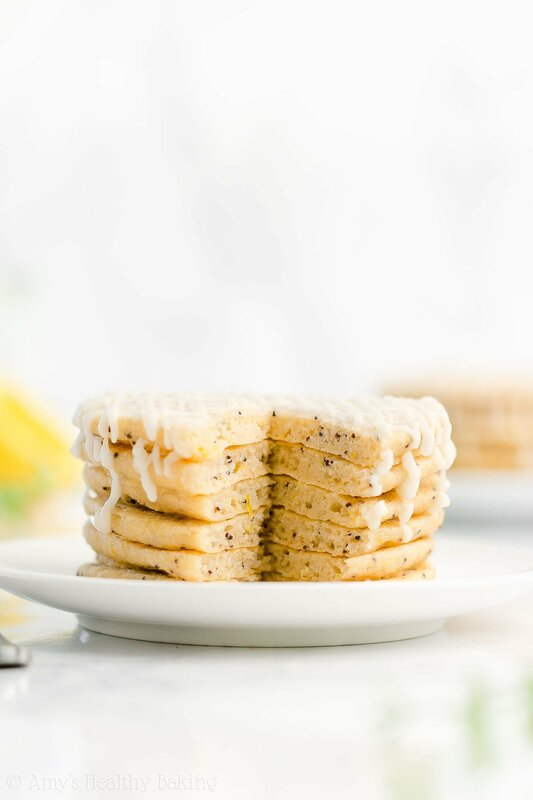 All of those air bubbles help create a more light and tender texture in your healthy lemon poppy seed pancakes. Science can be really yummy, don’t you think?? After stirring in a bit of milk and water, then it’s time to cook your healthy lemon poppy seed pancakes! I’ve already gone over the best tips and tricks for cooking perfect pancakes here (definitely worth going through, especially for the photos! ), but I’ll quickly cover a few things. Use a scant 2 tablespoons of batter for each pancake. I have this handy 2-tablespoon measuring spoon. I fill it up not quite all the way, and I use this mini spatula (isn’t is cute?) to transfer the batter into my pan and spread it around a little so my pancakes look circular. For more information on the best pans and how to avoid the pancake “skirt,” see my blog post here! If you’ve stuck with me this far… Then you now you have a stack of happy, fluffy, oh so delicious pancakes ready and waiting to be devoured! And when you make your own, remember to snap a picture and share it on Instagram using #amyshealthybaking and tagging @amyshealthybaking IN the photo itself! (That guarantees I’ll see your picture! 😊) I’d love to see your healthy lemon poppy seed pancakes! 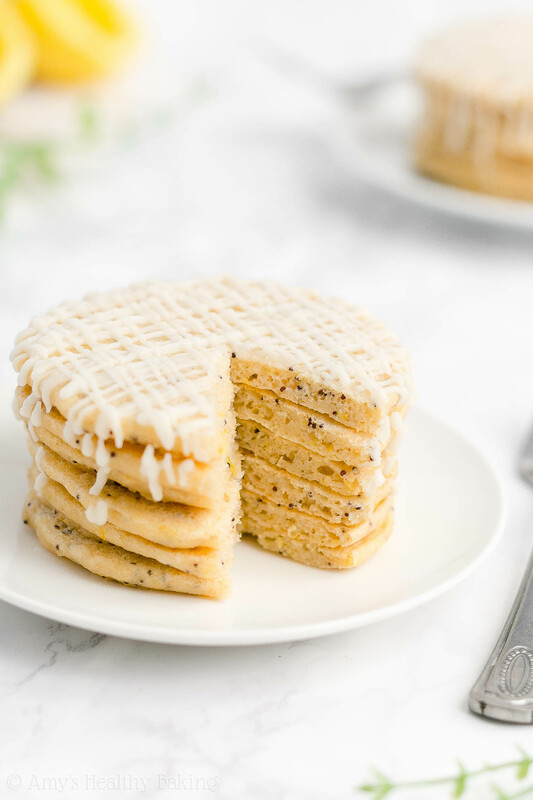 These pancakes are moist and fluffy with lots of bright sunshiny flavor and poppy seeds in every bite! They taste very similar to lemon poppy seed muffins (my childhood favorite muffin flavor!). These pancakes reheat well and will keep if stored in an airtight container in the refrigerator for at least 5 days (if not longer). They also freeze well! Using a scant 2 tablespoons of batter for each pancake, dollop the batter onto the hot pan, and spread into a circular shape using a spatula or back of a spoon (if desired). Let the pancakes cook for 2-3 minutes, or until a slight skin starts to form around the edges. Slide a spatula underneath, and flip. Continue to cook for another 1-2 minutes or until cooked through. Re-coat the pan with nonstick cooking spray, and repeat with the remaining batter. For the best lemon flavor, use lemons that are pure yellow with no green spots. Use the full amount of zest! The zest actually provides the majority of the citrus flavor, so don’t skip or reduce it. 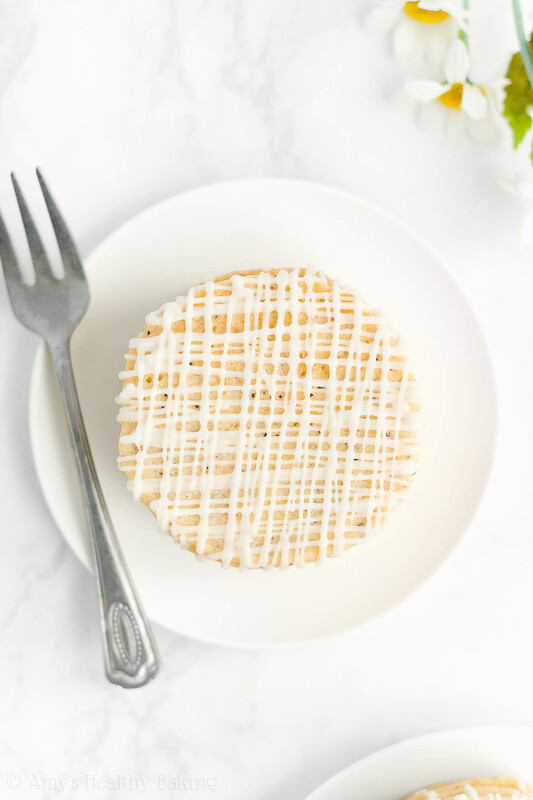 Optional Drizzle: Stir together 2 tablespoons (18g) confectioners’ style erythritol and 1-2 teaspoons of lemon juice or milk (any kind!) in a small bowl. Transfer to a zip-topped bag, cut off a tiny piece of one corner, and drizzle over the pancakes. ♡ …and the rest of Amy’s healthy pancake recipes! Would buckwheat flour do the trick as well? I really appreciate your interest in my recipe Isabelle! I don’t have much experience with buckwheat flour, so I’m not entirely sure. However, if you’ve been able to use it in other similar pancake recipes, then it should probably work here too! 🙂 I’d love to hear what you think if you try these pancakes!